Canadian of Ukrainian origin killed in terrorist bombing in Bali. 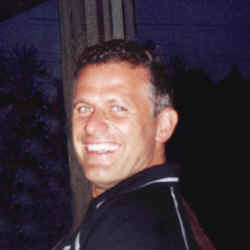 Mervin Popadynec, a Canadian of Ukrainian origin, was killed in a terrorist bombing in Bali on October 12, 2002. The following is a press release by the family. It is with profound sadness that the Barney and Mary Popadnec family announce the tragic loss of their dear son and brother, Mervin on October 12, 2002 in Bali, Indonesia. Mervin was born July 20, 1964 in Wynyard, Sask., the eighth of eleven children. He grew up on the family farm and received his public and high school education in Wynyard. He graduated from the University of Saskatchewan with a P.Eng, mechanical engineering, in 1988. He began his engineering career in Calgary in 1989 and pursued employment opportunities internationally. This also fulfilled his desire to travel and explore other cultures throughout the world, including Costa Rica as his home away from home. At the time of his death, he was working for PetroChina, in Jakarta, Indonesia, as a senior project facilities design engineer for construction of oil and gas processing refineries. He had also worked in Turkmenistan, Texas, Alabama, Venezuela and Trinidad. His agility, skill and passion for rugby presented many opportunities to play on a number of teams as well as travel to tournaments in Newfoundland, Ireland, Texas, Alabama and Bali. He was a member of the "rugby" family, a sports enthusiast in general, and a talented athlete who also participated in broomball, kickboxing, hockey, tae kwon do and Ukrainian dancing. Mervin was a kind, caring, fun-loving, free-spirited and generous person. Family and friends were very important to him. Attending family gatherings was a priority and he always made every effort to attend. Mervin and a number of friends gathered annually at the Calgary Stampede. He also visited with Uncle Andy Popadynec in London, England every year. He will be lovingly remembered by his parents, Barney and Mary Popadynec, brothers and sisters, Anne Hall, children Sharon and Neale, Marilyn (Emil) Kohuch, children Alexander and Adina, Janice Popadynec (Ron Marlatte), Darlene (Kevin) Cooper, children Sarah, David and Kathryn, Eugene, Carol (Dale) Pederson, children Jillian and Jason, David (Karen), children April, Eric and Allison, Gerard (Paulette), children Chris, James and Kodi, Joan Popadynec (Art Michener) and Sheldon, as well as all his aunts, uncles and cousins. He was predeceased by his grandparents, Mike and Annie Popadynec, Mike and Katherine Petryshyn, and nephew Micheal Hall. A memorial will be held Saturday, November 2, 2002 at the Wynyard Civic Centre at 2:00 p.m., Wynyard, Saskatchewan. Funeral services and internment to be announced.